In Table Top Racing: World Tour, your control 12 cars through lovingly crafted miniature routes - passing Sushi, Toy Robots and Baguettes. For each race you will receive coins, bonus coins and experience in the form of XP. The first two currencies bring you coins with which you can buy new cars or can tune existing vehicles. In this guide we will show you how you can farm more coins and also have a youtube video for you that shows a glitch that allows you to get more coins. - Once you have 10,000 coins, you should definitely buy "Bling Wheels”. To get your extra coins for weapons or counter-attacks on opponents. You need it not to charge because they work permanently. - Use as many weapons as possible to attack. Particularly the acid bath-power-up is useful. Are you on the first position, miss the Power-up in many places. Driving many opponents on the oil slick, you get even combo bonuses. - We have received many coins as we are always driven by power-up bubbles as long as we got the acid bath attacks. Drive through a bubble and miss the Power-up immediately if it is not to the oil-attack. Drive until it comes to the acid bath-power-up by the bubbles and can grab many coins. - While you ascend further in the normal campaign, you should definitely check the special events. Drive one of those, you can get a particularly large number of coins. For some special events you have to buy special cars. If you already have a lot of coins, then you should do this in order to obtain even more trophies. - Also, the multiplayer mode is particularly suited to get more coins. Create your own race and play with your friends. 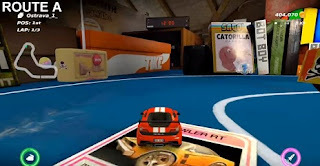 In these races you can also search the hidden coins and collect. They bring you even more money. The YouTuber user HochNumberOneDahler has discovered a glitch for Table Top Racing: World Tour with which you can quickly farms more coins.